At Room & Board, we believe that community involvement contributes to our overall wellness-both as individuals and as a company. Our Minnesota market partners with CommonBond Communities, a local non-profit organization that manages affordable housing complexes in Minneapolis and St. Paul for families and senior citizens. 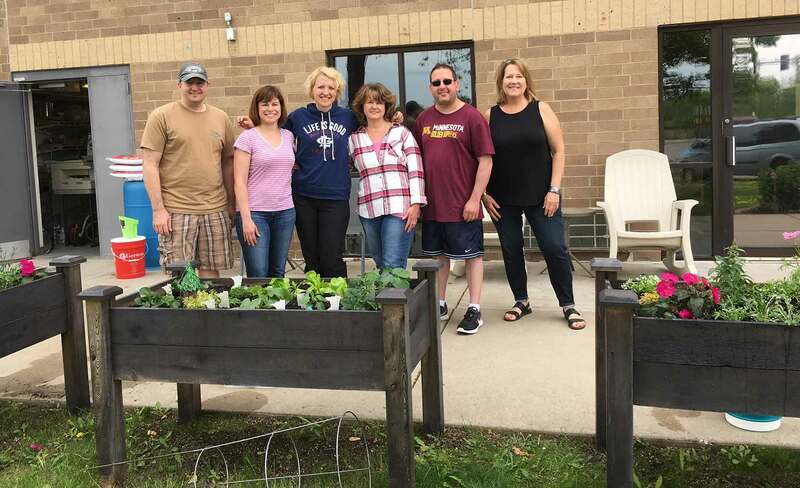 As our partnership develops, staff members from each of our Twin Cities locations find ways to respond to the needs of our friends in CommonBond’s communities and create opportunities for us to share our time and talents. 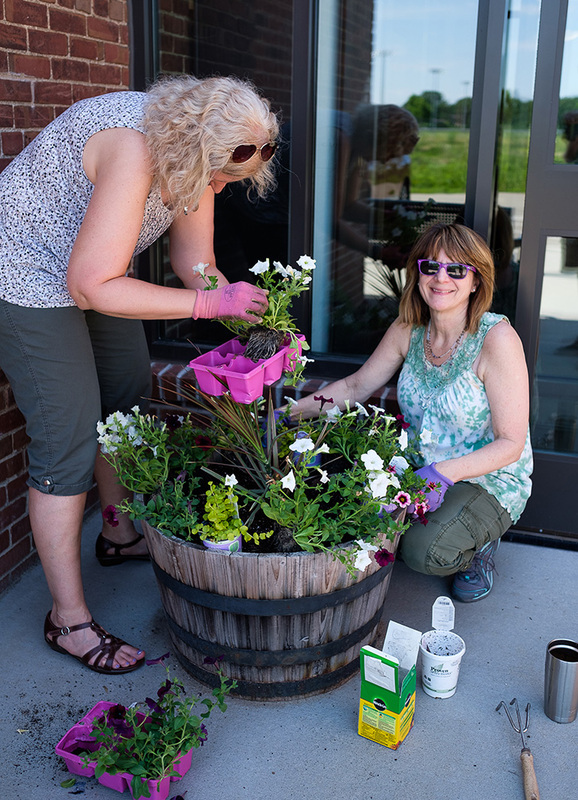 Room & Board staff members plant flowers at a CommonBond community. The partnership first started in May 2012 and has been going strong ever since. Staff members from the Central Office, Edina showroom, Minneapolis / St. Paul & National delivery center, Minnesota warehouse and Minnesota Outlet all spend time working with this community partner. Staff members spruce up the grounds at a CommonBond senior community. Staff members have fixed up outdoor spaces with new furniture and raised flower beds. They have also led fun events including a bbq and pizza in the park, built a shed for residents to store their outdoor furniture and supplies, served meals, donated books and more. Our teams manage a school supply drive annually and a winter hat, mittens and blanket drive, bringing in many donations to share with the residents. Room & Board also supports the annual gala, a large fundraising event for the nonprofit organization. 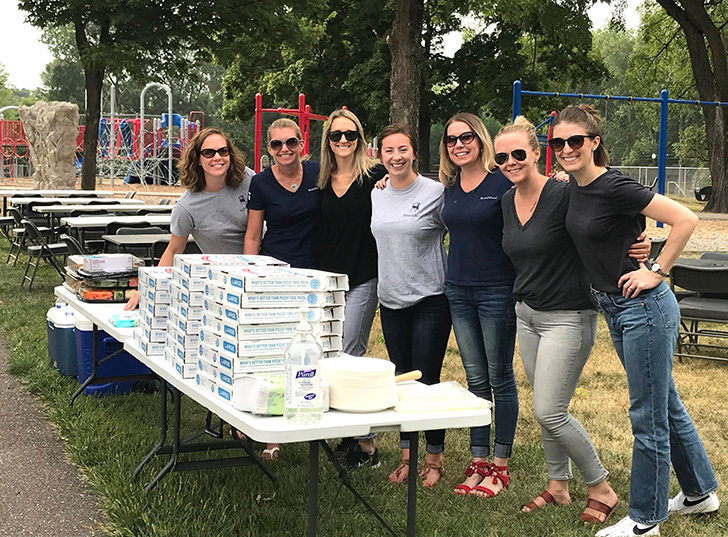 Members of Room & Board’s Human Resources team coordinated a pizza and bingo in the park event for two CommonBond community buildings. CommonBond’s Fort Snelling property is a newer property. They purchased the building and renovated it into one-bedroom apartments for homeless veterans. Recently, our team from the Central Office reorganized the supply room that was in desperate need of some TLC. 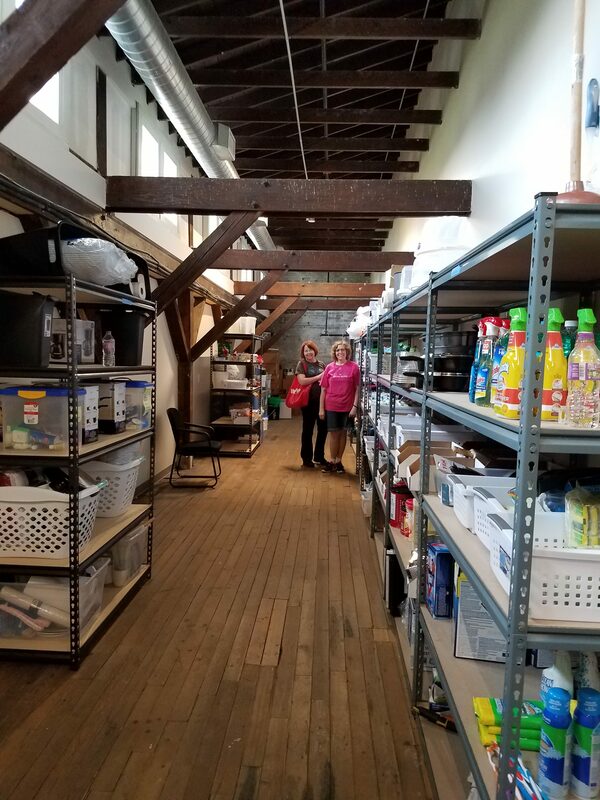 Twin Cities staff members cleaned and organized a large closet at CommonBond. CommonBond staff members are busy with the day-to-day work of running the buildings and they are busy with residents. A team of eight Room & Board staff members collaborated and made a huge impact with a few hours and $400 worth of shelving. “It was a complete 180 on that storage space,” said Brenda. 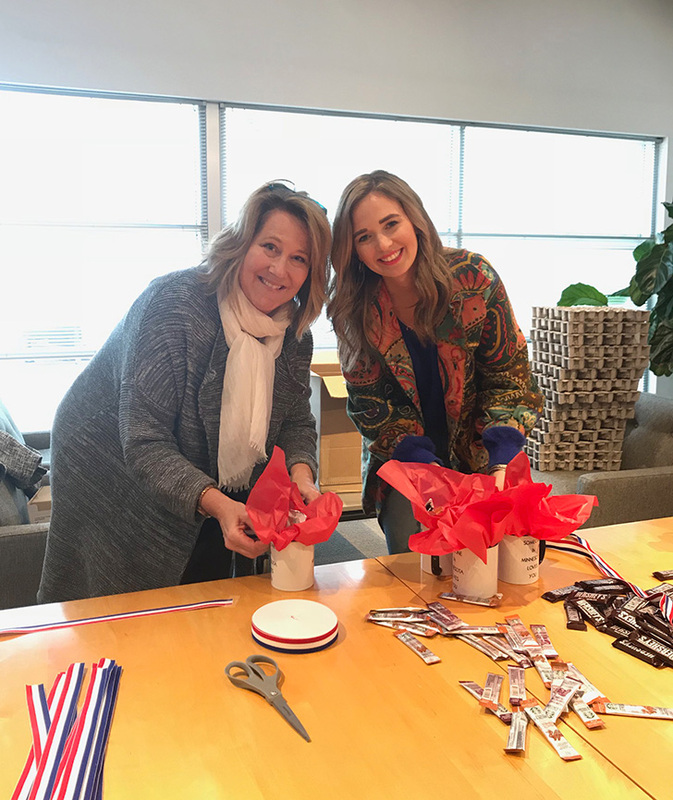 For Veterans Day, the Twin Cities team delivered mugs filled with treats and a thank you card to the veterans at the Fort Snelling property in honor of their service. 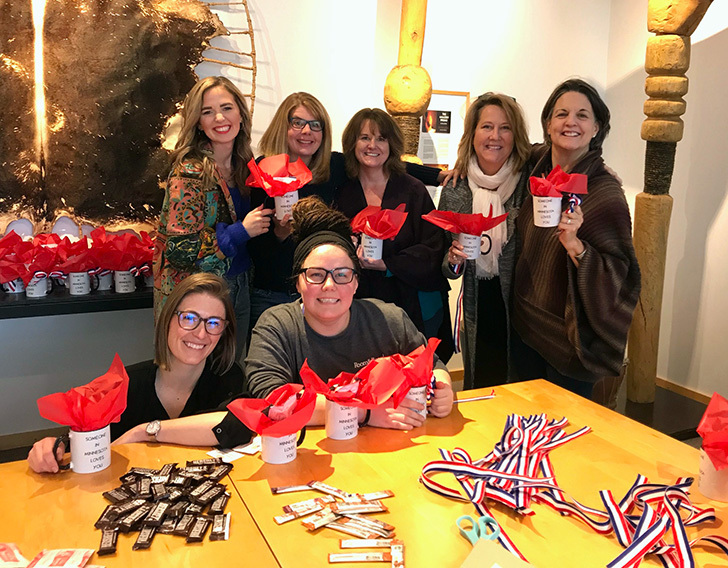 Central Office staff members work on gifts for veterans at CommonBond’s Fort Snelling property. The team prepares a small token of their appreciation for Veterans Day. Room & Board also provides furniture and other donations to the overall organization or properties for certain needs as they arise. “This work helps residents take pride in where they are living and making it feel more personal. It’s not just another apartment. It’s a home” Brenda said. CommonBond Communities, the Midwest’s largest nonprofit provider of affordable housing and support services, has served the region for over 40 years.